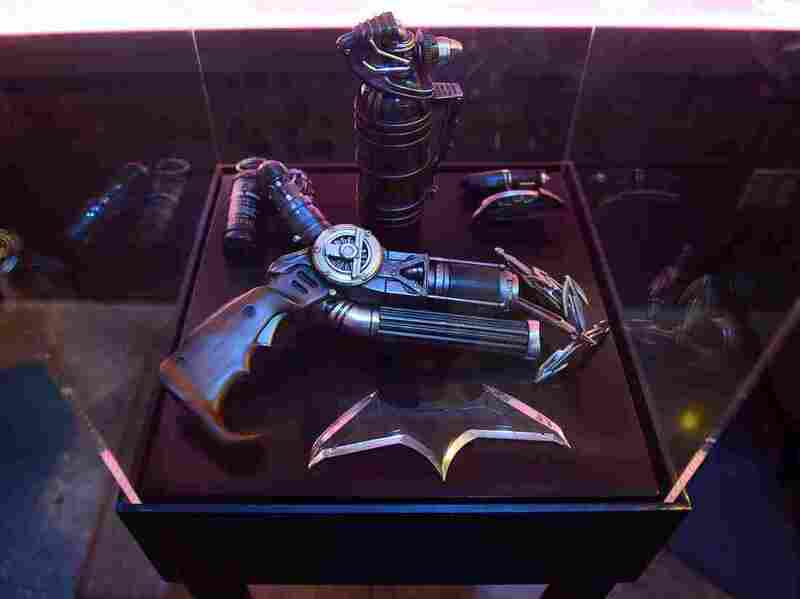 TSA Reminds Passengers: No 'Batarang' Superhero Weapons On Flights : The Two-Way The TSA has repeatedly reminded air travelers to put sharp Batman and other superhero paraphernalia in checked baggage. Batman's gun from Batman v Superman is displayed with a batarang and other weapons. The Transportation Security Administration is reminding Batman enthusiasts to check their superhero weapons when they fly. TSA agents at the Salt Lake City International Airport shared an image on Instagram of multiple batarangs that came through a security checkpoint there, and reminded passengers that the bat weapons should be "placed in your checked baggage along with your grapple gun, bat-saw, collapsible bat-sword, and other utility belt items." This isn't the first time the TSA has struggled with superhero-related weapons in airports. "Every year during Comic-Con International, our officers have issues with the various items that people purchase and then either carry-on or place in their checked bags. These come in the form of figurines, costume items (including replica and real weapons) and other mementos that generally alarm our checkpoint and checked baggage screening systems and result in a bag check." In June, Peter Mayhew, who played Chewbacca in the Star Wars movies, was stopped at the airport in Denver when agents thought his light saber-shaped walking cane looked suspiciously like an actual weapon. After the incident, the TSA told The Associated Press: "Because of the unusual weight of the passenger's cane, a security officer alerted a supervisor." Mayhew, who is more than 7-feet tall, eventually made it through the checkpoint with his cane.